Guest Lecture: ‘A Private Space as Visual Text in 17th-century England’ University of Tampa, FL. University of Tampa Library, Room 203. Tampa, FL. Professor Meakin will speak on her recent book, The Painted Closet of Lady Anne Bacon Drury (Ashgate, 2013), an extraordinary subject engaging art installation, women and the visual arts, and the specialness of private space in the design and use of the early-modern home. James Gillray’s reputation in the two centuries since his death has been as varied and layered as his prints. Trained at the Royal Academy, he failed at reproductive printmaking, yet became, according to the late-eighteenth-century Weimar journal London und Paris, one of the greatest European artists of the era. Napoleon, from his exile on St Helena, allegedly remarked that Gillray’s prints did more to run him out of power than all the armies of Europe. In England, patriots had hired him to propagandize against the French and touted him as a great national voice, but he was an unreliable gun-for-hire. At a large public banquet, during the heat of anti-Revolutionary war fever, he even raised a toast to his fellow artist, the regicide, Jacques-Louis David. Gillray produced a highly individual, highly schooled, and often outlandish body of work with no clear moral compass that undermines the legend of the caricaturist as the voice and heart of the people, so that the late Richard Godfrey described him as a caricaturist without a conscience. Following 2001 and 2004 retrospectives in London and New York, and fuelled by scholarship of a new generation of thinkers, our era’s Gillray is just now coming into focus. To commemorate the 200th anniversary of Gillray’s death, and in conjunction with the Ashmolean Museum’s exhibition, Love Bites: Caricatures of James Gillray (26 March-21 June 2015), based on New College’s outstanding collection, we are organising a one-day conference at the Ashmolean Museum to hear and see the latest Gillray scholarship. We seek proposals for papers that address any aspect of Gillray’s work or that consider artistic duty or purposeful negligence of duty in the period around 1800. Comparative, formal, contextual, and theoretical approaches to Gillray and our theme are all welcome. Proposals should be a maximum of 200 words and be accompanied by a short biographical statement. Organised by Todd Porterfield, Université de Montréal; Martin Myrone, Tate Britain; and Michael Burden, New College, Oxford; with Ersy Contogouris, Université de Montréal. The programme will be announced on 21 November 2014. The mechanization of print during the nineteenth century led to the proliferation of illustrations that generated cultural and aesthetic ideals and changed social perceptions on issues of identity such as race, nationality, class, and gender. Illustrations filled Victorian print culture, and accompanied novels in both serial and book form. British illustrated newspapers (The Illustrated London News and Illustrated Police News), advertisements (Pear’s Soap), satirical publications (Punch and Fun), and children’s literature, all served to foreground visual culture, ultimately redefining it. The intersection of illustration studies and gender studies occurred not only within the illustrations that accompanied nineteenth-century texts but also outside of them. Although illustrators of the period were largely male, there were several skilled female illustrators including the well-known artists Kate Greenaway and Beatrix Potter, as well as the lesser known Amy Sawyer, Mabel Lucie Attwell, Elinor Darwin, and Edith Holden. Avenues opened up by the digital humanities for visualizing gender in Victorian culture. Please send articles of 5-8,000 words to both the guest editors, by March 15, 2015 (earlier submission is encouraged). Adhere to MLA style, using endnotes rather than footnotes. Please include a coversheet that includes your contact information and a short (100-150 word) bio with your article submission. Please contain all identifying information to the coversheet. Feel free contact us at the email addresses listed below with any questions or concerns. 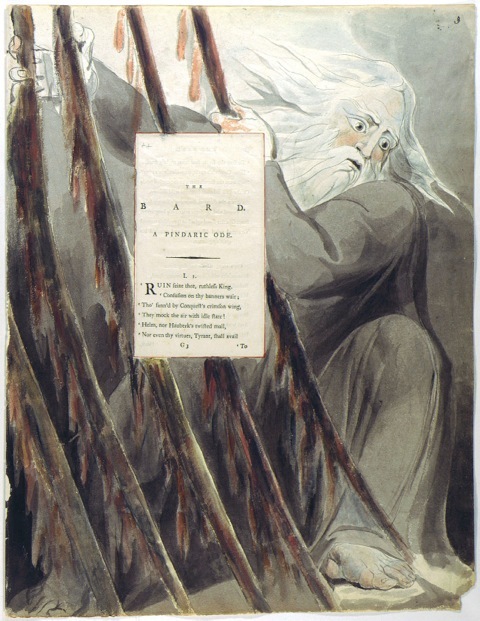 The designs for Gray’s poems are among Blake’s major achievements as an illustrator. They were commissioned in 1797 by Blake’s friend, the sculptor John Flaxman, as a gift for his wife Ann, to whom Blake addressed the poem that ends the series. The commission may have been inspired by the Flaxmans’ seeing Blake’s water color designs to Edward Young’s Night Thoughts, begun in 1795. The Gray illustrations follow the same basic format. Blake cut windows in large sheets of paper and mounted in these windows the texts of Gray’s poems from a 1790 letterpress edition. Blake then drew and colored his designs surrounding the printed texts. Although listed by William Michael Rossetti in his catalogue of Blake’s drawings and paintings, published in the 1863 and 1880 editions of Alexander Gilchrist’s Life of William Blake, the Gray illustrations were virtually unknown until their rediscovery by Herbert Grierson in 1919. They are now among the Blake treasures at the Yale Center for British Art in New Haven, Connecticut. Blake’s illustrations respond to Gray’s poems in a variety of ways, but always with respect for the specifics in the text. Many motifs are visualizations of Gray’s metaphoric images. The Gray illustrations share iconographic and stylistic similarities with the Night Thoughts designs; both series are indebted to the pictorial imagery Blake developed in his illuminated books of the early- and mid-1790s. For the more comic passages in Gray’s poems, Blake deployed a broad, almost caricature-like style. Many of the designs emphasize the imagination at work in the world through inspired acts of reading, writing, and performing music.